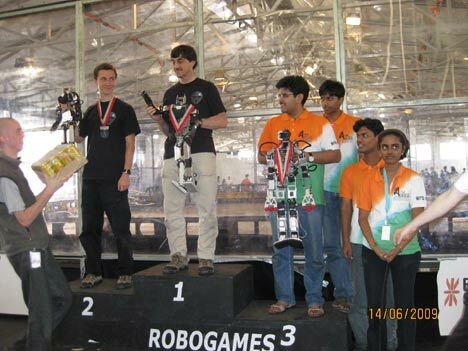 It all started when the team of undergraduate students built a prototype biped with scrap aluminium and motors lying in the Robotics lab at BITS-Pilani. The eight member team at CRIS (Centre for Robotics and Intelligent Systems) named the humanoid robot ‘AcYut’, which translates to: “The one who never falls.” They took first prototype to Robogames, the world’s largest open robot competition in 2008, where it came sixth place. “We were against 250 teams, who came from around 26 countries. It was an enriching experience. We learnt a lot more about humanoid designs and the shortcomings of AcYut 1.” says the team diary. With new insights, they spent Rs 30 lakh on the second prototype the following year, equipping it with more powerful motors that costed $450-500 each. A stronger, faster, and bulkier AcYut II bagged a Bronze medal at Robogames this year at in the middle weight humanoid combat category. 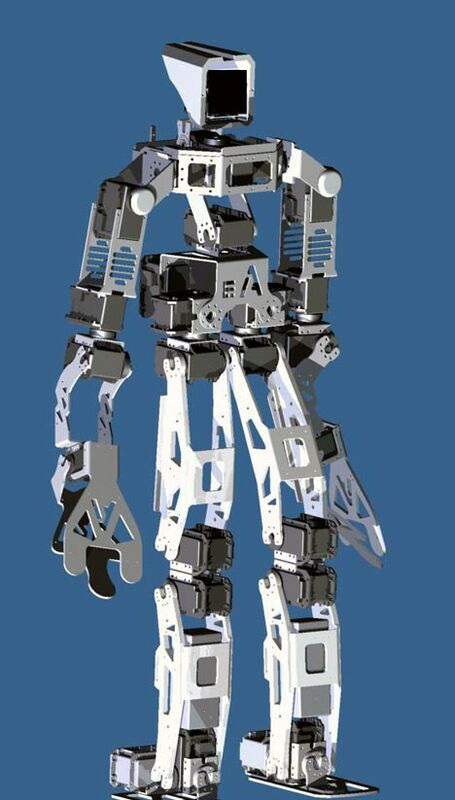 At present, AcYut’s capabilities include Teleoperation: it can be controlled using a hand-held remote and a body suit, which gives a greater degree of dexterity, making AcYut dance and play soccer. At college events, the robot is a hit with the ladies, moving to Bollywood numbers while pulling facial expressions on its 1.8 inch OLED screen. Acyut II can lift and manipulate objects, as well, with 26 degrees of freedom. AcYut II runs on a dual platform of Atmega-based Arduino microcontroller, and a Linux prrocessor. AcYut is powered by 21 V Lithium Polymer batteries and a number of sensors integrated into its design. 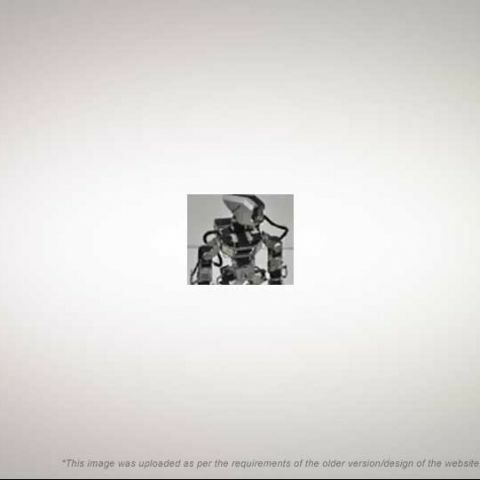 The BITS team examined a lot of research papers related to robotics when determining that bipedal humanoid robots would prove highly useful when coupled with of telepresence capabilities. Equipped with a number of new control algorithms for gait control, they predict that humanoid robots in the future will become more lifelike, and adapt to complex tasks in uncertain environments. Sushma Vallabhaneni, the team lead says. "Humanoid research is one of the fastest growing fields of human knowledge, and its research has far reaching implications in many fields." In countries with ageing demographics, they are expected to do household chores and remote surveillance, but the team also envisions future AcYuts being used in defence and space industries. “We see humanoid robots being built on a commercial scale in less than 20 years. The robotics industry can generate a lot of employment in India, and can be used for security and household chores. If developed suitably it can be adapted to space exploration and defence as well.” said Atin Angrish, one of the eight members of the AcYut team. The BITS team also shared their plans for Acyut III, upgrades include: an on-board Linux computer that will run dynamic inverse kinematics algorithms to give AcYut the intelligence to move on its own, in dynamic environments. They also plan to add an inertial measurement unit (used in motion capture technology) to give it more stability and adapt to environments in real time. The result? A fully functional humanoid capable of almost all the activities a human being can perform. With future upgrades, the robot will be capable of aiming, loading and shooting rifles, unlocking doors with keys, and disabling explosives. With new sensors it will be able to detect, classify, and track moving objects including humans. In the outdoor environment, it will be able to adopt a tactical posture and gait, running, jumping and crawling like a seasoned infantry soldier. 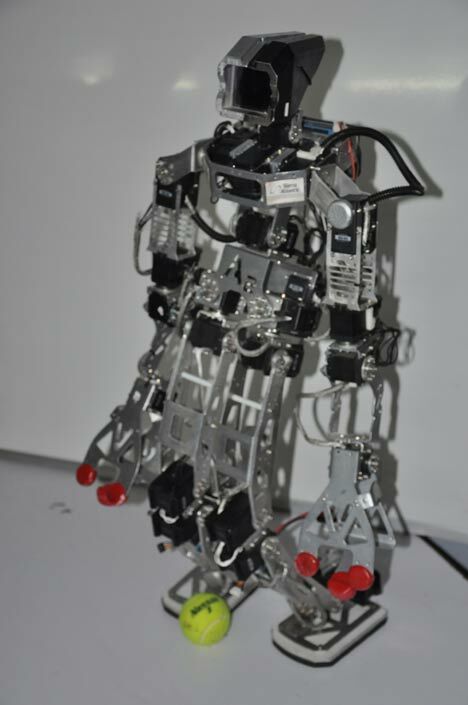 “We want to fulfill our vision, which is to make a stable research platform for an Indian humanoid robot” said Atin. Team had to scrape funds together from former BITS alumni to go to the IDEEN expo in Germany this year. They made it to national TV there, and were featured on their “best projects” list. They are currently looking for sponsors who are willing to support research and development of this robot. Visit blog.acyut.com for more information.